I'm not a believer in the word faith movement, but I'd like to think that downing this pot of echinacea tea will keep me from getting sick. I'm not much of a tea drinker, but this isn't that bad. Maybe it's because I'm drinking it with a slice of spearmint gum. I said slice, yes. I said it once as a joke, and my husband laughed and laughed. I've decided since to refer to sticks of gum as slices of gum. I'll start my own word movement. Baby, that's a goooooood chicken dish. Tonight we're having one of our favorite dishes, and one of my favorite to make because it involves the slow cooker, Chicken Curry with Peaches. I originally got it from, I think, Cooking Light (that or Taste of Home, my all-time favorite cooking magazine, though you have to really watch portion control since few of the meals are exceptionally healthy). It's amazing to me how you can take just a few ingredients and make a most delicious meal. Chicken thighs cut up, salted and peppered. 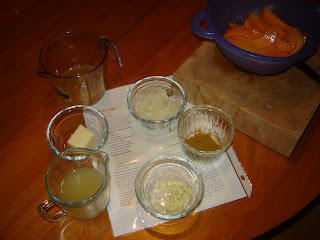 I use real (and more) onion than the called-for 1 Tbsp dried, minced onion, and three, not two, garlic cloves. Some curry, some butter (melted), chicken broth and a half cup juice from a big can of canned peaches (which I'll add later). 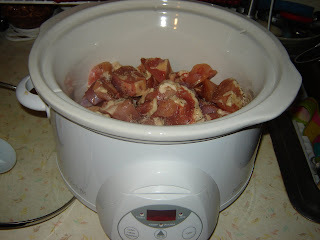 Mix it together and pour it over the chicken, and four hours later... Delicious food! When the chicken is done cooking, you remove it and add a corn starch and water mixture to the broth, along with the peaches and some raisins if you want, let it heat, and THEN your done. I like to serve it over basmati rice. Op! 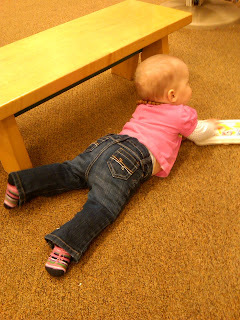 Baby is about to awaken, and speaking of baby, I caught her doing this today. 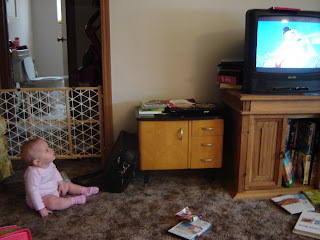 I'm not sure what she was seeing, but she was intently watching. I think she must be a prodigy of some sort. Roses given to me by my husband, who was given roses by co-owner of Blue Bouquet (www.bluebouquet.com), Drue Carr, upon her thirtieth birthday. I guess Drue (yes, we named our daughter after our dear and talented friend Drue) was sad that I couldn't be there and so sent Collin home with a dozen roses for me. They are dead now, but they were gorgeous. Thanks to Brandy Criger, I now know "what not to wear" and was able to purge five bags worth of probably ten-years-old clothes. 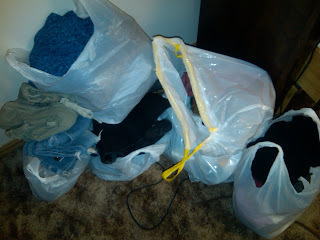 I consigned two other bags and a hanging bag full. Too many clothes? A resounding Yes. 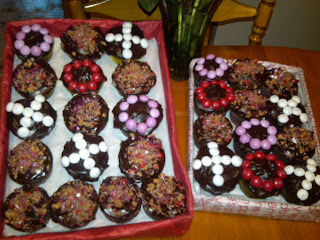 Made these for our friends and work colleagues last Saturday. They look like a box of chocolates! And tasted even better. 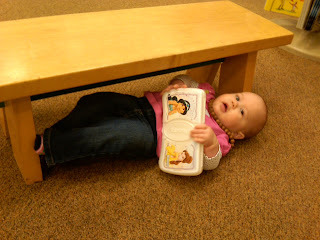 I love taking her to Barnes and Noble (or any place that has a "kid zone"). And...there she is! With her princess wipes container (a favorite "toy"). Wish I had a photo of the breakfast we ate Valentine's Day morning pre-church. It involved cracking eggs over top a casserole and baking it. Man, oh man. With homemade biscuits and honey, I could eat until I'm ill. I get to work early so I can tinker around before I have to really buckle down. If I don't work at work, I will not survive the rest of my life. I feel so busy these days. I want time to read books outside of work (more than five pages at a time). 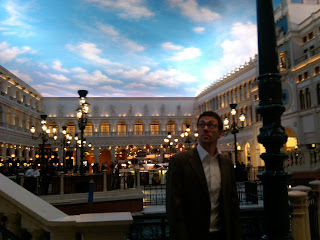 I want to upload pictures from my phone and camera and blog about the things I've taken pictures of lately. I want to have a cleaner house. I want to do more for others. I do, do things for one other - Drueby. I would love it if some of these schools to which Collin has applied would call him. He's worthy of an interview. I'll be honest. I'm angry that he hasn't been called. I'm angry at these people on these committees who pass over his vitae and cover letter. I'm sad when he finds out that another job that he'd applied for has been filled. Right now that's as far as my anger goes, but it's getting scary. I've said that God is going to take us right to the point of thinking Collin's going to have to work at Starbucks and THEN give him a job. Maybe that's what he really is doing. Maybe Collin will have to work at Starbucks. I need patience. Now to work. It's 8:08. Oops! A couple of the meals I've made recently. 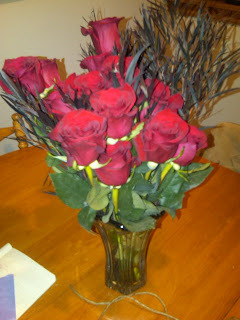 The flowers I got for Valentine's Day. The fact that my baby, as of today, is pulling up and suddenly very clingy. 1. I love not wearing makeup and the fact that it usually takes me fifteen minutes to get from bed to door. I do not think women need to wear makeup all the time. 2. 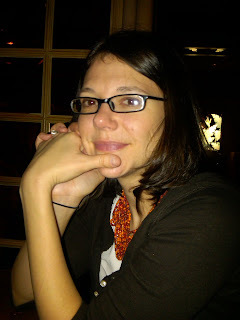 I love glasses and have worn mine daily for months; and my husband has worn them daily since I met him. 3. Pants and tops are great. Go for it. I wear them all the time. But I think it's time to start trying again. I know that C would like it if I wore a skirt now and then, wore makeup now and then, and generally cared about my appearance now and then. :) I think I would like it too. Actually I know I would, because yesterday when I was getting ready to take Drue to the mall for our weekly playdate (hate that word), I was getting ready and threw my hair back in a ponytail, put on some ripped jeans, sneakers, and an oversized shirt that really I should only wear when I'm pregnant. I looked in the mirror and saw what I see every day but thought, Wait a minute. Drue's not up yet; I've got at least fifteen minutes until she is. Why don't I put on something nice, throw on a little makeup, and put contacts on my eyeballs? It won't take long, and my hair is clean enough that I don't HAVE to put it back. Let's do this! And I did. And it's funny... At first, at the mall, I thought people were looking at me because I looked stupid. Surely, I thought, everyone knows I'm just not girly, so why am I trying to be? I look stupid in makeup and have too much on. (Really I didn't at all; I had barely any on.) I was wearing a dress and had my hair pinned halfway back and just felt foolish. But then I saw myself in the reflection of a store window and thought I didn't look half bad, and it struck me: First, people are NOT looking at me; how self-centered AM I? And second, if they are looking at me, maybe it's because I look good, not bad. From that moment on I felt really confident. Until, on the way home, I spilled a soda down the front of my dress, but that's another story. I went home and put Drue down and spent her naptime going through my closet and reorganizing - and rediscovering - my clothes. I have a good number of cute skirts, and my nice jeans actually fit. I have some really cute tops in there. Now all I have to do is shine my black boots, because today I got some new makeup and a new black cardigan from Gap (with a gift card) and a little casual dress from Old Navy, and I feel like a new me. (Hyperbole.) I even did my hair in a new style this morning - something I NEVER do. So what's an extra fifteen minutes now and then? I think I've found my girly. When I see God at work in ours or others' lives. Watching '90s television shows with my husband after a long day. Drue giving me a smooch or laughing, or basically doing anything at all. Yummy coffee in the morning. Going through food magazines and cutting out recipes. And of course, the very cliche but very real, spending time with friends. I'm an extrovert, y'all. 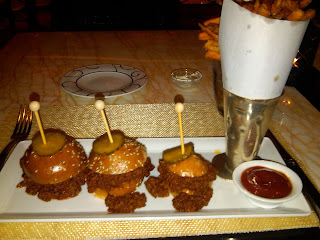 These "Fancy" Joes hit me the following night at Encore's Society Cafe. 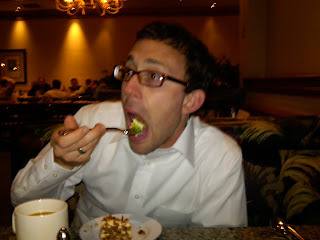 A very yummy twist on American cuisine, in a very posh hotel. That's Donny and Marie in the background. The Flamingo should be the next to go after Circus Circus and The Riviera. Or are these three too "staple" to go? 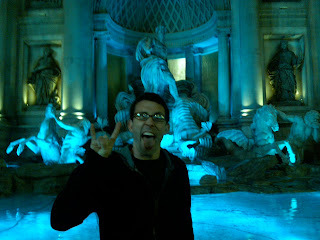 It's just so gross sitting there next to Caesar's and the Bellagio with its dirtiness and pinkness, etc. Me in Paris. I played my first poker table here and lasted ten whole minutes. Impressed? 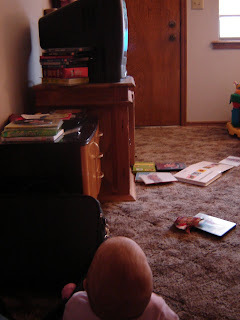 A room worth crying for? 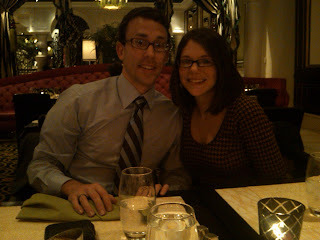 We went to Vegas for the buffets. 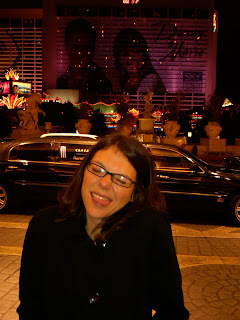 Especially the seafood buffet at Mandalay Bay. 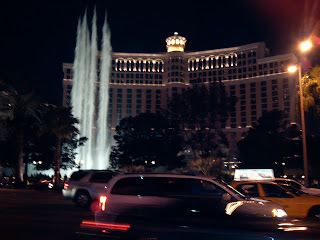 The first time we saw the fountains at Bellagio, the music accompanying the show was L-A-M-E. The second and third times: it was one of those things where the music playing makes you feel really cool. Tell me you know what I mean. 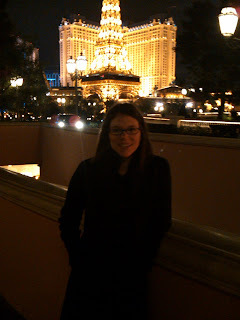 Everyone walking by has to feel cool when "Luck Be a Lady" or "Viva Las Vegas" is playing and they're standing outside the Bellagio, don't they? Maybe cool is the wrong word...??? All in all, we had a great time. We walked a lot. My hip flexors hurt a lot. My knees ached a lot. I loved having zero responsibility a lot. And now I get to see my baby again a lot. All is well.